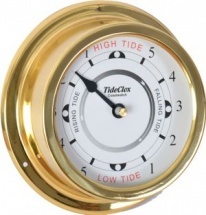 The Coastguard is possibly the best priced very attractive Spun Brass Time & Tide Clock in a 5.75" (148mm) casement with a 4" (100mm) face, flat glass lens and stylish metal hand. 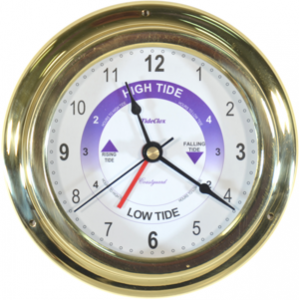 Ideal in the home, office, or on a boat. Fitted with a 12 hour quartz movement mounted on a synchronised slip gear for the daily Lunar tidal pattern of 12 hour 25 minutes. Requires 1 x AA Battery - 12 month Guarantee & Instructions. Fitted with our own special 12 hour 25 minute Lunar quartz movement using a single AA Battery to keep the smart black open metal indicator hand pointing to the tidal trend of the day. Super impressed. It arrived quickly and well packaged and was a huge hit with my husband on his birthday.